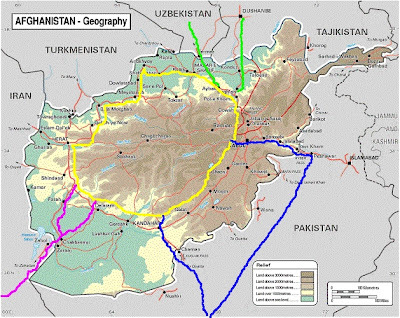 Truth by Kbaig: Trade Route Agreement…? Before starting discussion on today’s topic I would like to tell u brief story of Jinn’s fall. In poor’s village during play a child found a bottle. Due to the color of bottle it was impossible to see what it contains, however due to its wait it seemed as it has something in it. Child tried his best to open the bottle but failed. At last threw the bottle on a stone. The bottle broke and smoke came out of it. That smoke then changed into jinn. Child was watching this scene with astonishment. When child saw such a big jinn he started running towards home. At that time jinn called him and said, “do not fear my lord. You have given me freedom and from today I’m your slave. Whatever you will order me I will fulfill it”. Child got courage and looked at the mighty jinn and questioned innocently, “will you do whatever I will ask you to do”? Jinn bowed his head and said, “Slave’s duty is to obey his master’s orders”. Child took the jinn with him and went to his home. Arriving at home he called his mother happily who was trying in vain to make fire for making food. Child looked at mother and said, “I have brought jinn for your service, whatever you will order he will do it”. When mother looked at jinn she got astonished, jinn’s height was more then the tree in the lawn and he was standing respectfully. Mother asked jinn, “what is my son saying? Can you do all the work?” Jinn replied respectfully, “you are my lord’s mother. Whatever you will order it is my duty to fulfill it”. Mother forwarded the pipe towards him and said first of all make fire in the stove, I have got tired of trying to make fire. Jinn replied “what is the need of pipe, on my one gesture there will be a big fire in your house”. Mother got worried and said, “are you crazy? In this way whole house will get burnt. Just do whatever I have asked you to do”. Unwillingly jinn took the pipe and made fire. After sometime mother ordered jinn to bring little salt from the neighbors. Jinn replied, “mother of my lord you are telling little work, order me and I’ll bring salt’s mountain to your home”. Mother shouted, “no! My house will get destroyed, go and bring salt from neighbors”. Jinn obeyed. After sometime mother ordered jinn to bring water from street’s water pump. Jinn replied I turn the whole river to your house. Mother said, No! you will drown whole village. Jinn took the bucket and brought water. Time kept on passing in this way and jinn got smaller day by day. One day during the work mother asked nearly sitting jinn of few inches, “What happened to you”? Jinn replied, “leave that mother of my lord. It is all cause of you, I was a jinn I had power to turn rivers and lift mountains. But you used me for your little works and wasted me. If you now again order me to do big works I will again get big”. Now look at that “Pak-Afghan Trade Agreement”. In spite of all clarifications and satisfactions every Pakistani is worried. And thinks it as poison for Pakistani economy. But govt. is trying to give fake assurances, naming poison as sweets. Our leaders make thousand of lame excuses but whatever spokesperson for American foreign ministry said is enough to open our eyes. According American foreign ministry, “this historical agreement have been signed after one year’s continuous struggle. Between two neighbor countries it is very important and solid success, which is achieved after 45 years. However if foreign minister Helry has not intervened it was difficult to sign that agreement. Because Pakistan was not ready to allow India to pass through its land. While Afghanistan wanted that. In this way on the last with Helry’s intervention the differences were tackled. Both countries are entitled for congratulations”. What are Helry’s views of Pakistan can be judged after her statements after the agreement was signed. Which have nothing except threats. Whereas no one knows better than America that so called terrorism for which Pakistan is being black mailed Pakistan is the worst effected from this terrorism. However about India Helry has said, “America is thinking of making India permanent member of UN’s Security Council”. That statement was given by American foreign minister on 3rd June 2010 during a press conference in Washington. After this statement it gets clear that America is busy in formulating long term plans (economical and military both) and India has a central importance. 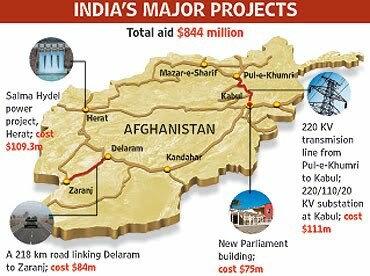 In this map India's interest and investment in different provinces of Afghanistan have been shown plan wise. 25th August, 1989’s afternoon a Fokker aero plane started its flight from Gilgit to Islamabad and was lost. There were 49 passengers, 1 air hostess, and four crew members on board. While passengers included 24 men, 12 women, 8 young children and 5 infants in their mother’s laps. At that time public have access only to govt. T.V. channel. Through which nation was told after 8 hours of the incident. In Pakistani record this plane is yet missing. Actually that plane lost way and entered into Occupied Kashmir and was shot dead by Indian army. However in order to save India from defame on international level on request of Rajeo govt. our govt. hid that fact. It was practical struggle to save soft image of India. In the same era our leaders saved India from breaking down by providing the lists of struggling Sikh’s for free Khalistan. But what Pakistan got or the leaders who provided with such a historical service, what happened, maybe nation can know that. Indian analysts themselves say that if Sikhs have been active for five more years no one have been able to save India from dividing into dozen separate states. According to them after controlling the Khalistan movement India has got rebirth after 1947. That India is now making Pakistan barren by stopping water of its rivers. India herself is sending terrorists and blaming Pakistan for it. The whole planning was to blackmail Pakistan and get route to central Asian states via Pakistan. How is it possible that on roads of Pakistan containers of NATO are not safe and they are trying to get routes from Tajikistan or Turkmenistan? India wants allowance to pass trucks from Pakistan for Afghanistan. India is so much hopeful that terrorists will not destroy its trucks on Pakistani roads. Very few people of Pakistan know that last year India has signed trade route agreement with Bangladesh. For this agreement America has supported India. 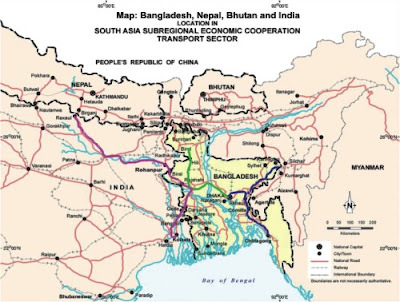 If my intellectual brothers research on importance for trade route through Bangladesh to far apart Indian states Meghalia, Aasam and Taripura and its need for India’s integrity. They can easily tell the nation the reason behind formation of Mukti Bahni in 1968 and Bangladesh. Because Pakistan has been denying India access to North Eastern states of India through East Pakistan. However after splitting of East Pakistan, Indian govt. succeeded in signing an agreement with Mujeeb for passage. But this “Agreement of Friendship” became the reason of murder of Mujeeb and so the agreement was broken. After this till 2009 India kept on struggling but it cannot gain success. 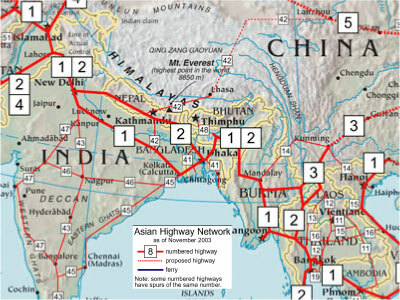 In September 2009, while signing agreement with Bangladesh India staged a drama of giving access to Bangladesh through India to Nepal and Bhutan. This was done just to satisfy Bangladeshi people on the will of Bangladesh govt. everyone knows for Bangladesh access to Nepal and Bhutan is useless. But in November 2009 troops of Indian Border Security Forces entered into Bangladeshi border areas and murdered 500 Bangladeshi people (which includes children, elderly and women as well) just for accuse of helping militants. As long as trade is concerned economic analysts know that Bangladesh’s trade deficit with India is more 6 billion dollars. Means Bangladesh is not more than a trade market for India. Why talk about Bangladesh we can look at our trade deficit (which is inclined towards India) and if we try to put light on these aspect pro-Indian groups declare it as “Conspiracy theory”. Does it mean that India is friend of Pakistan, spending trillions of dollars for well being of Pakistani and afghan people? No it is not like that. These all are part of expansionist planning, whose fruit India wants to eat in the form of Pak-Afghan Trade agreement. In the past wars were fought to search or capture resources for solution of economic problems and same rule is working today. The only difference is that in past weak nations were attacked and their resources were captured, while today without fighting war by capturing trade and markets such benefits are derived.